We almost at 5,500 Facebook Fans so we thought it was time for another fabulous Facebook Fan Exclusive Giveaway! We have an amazingly strong and loyal Facebook following and we just wanted to say Thank You! 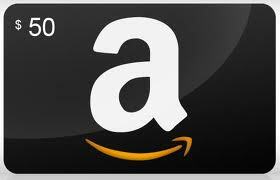 One Lucky “Deal”ectable Mommies reader will WIN a $50 Amazon Gift Card! We truly look after our Facebook fans and it even pays to be one! We have a number of giveaways lined up just for Facebook fans this year AND FB fans also get access to exclusive deals just for “Deal” ectible Mommies fans not available to everyone else! How would you spend the $50 Amazon Gift Card if you won this giveaway? This giveaway is sponsored by “Deal”ectable Mommies. KRE-O Transformers Optimus Prime just $30 Shipped – 57% Off! 20% Off Everything (Including Sale Items) at Zoolu! I’d love to win this to buy diapers for my new little one. Thanks for the chance to win. I enjoy visiting your site to find out about online coupons and good deals! Thank you for another wonderful giveaway. Thank you. What a wonderful prize. Congratulations on reaching having so many Facebook friends. Thanks so much. Thanks for this great giveaway! If I won I’d buy something for my fiance for his birthday. Great giveaway..I have a bunch of books on my amazon wish list that I want to buy. congrats! Thats a great achievement!!!! Thank you for the giveaway. I would buy supplies for the school year, like tissues and hand sanitizer. This would go towards a Kindle Fire HD. I would save it for Christmas. I would definitely buy a Kitchen Aid toaster! I would like a toaster. i love amazon, i always have a list of stuff i need and want fromt here, i would probably use towards running shoes, thank you! Thanks for the chance! Would love to have this to buy new workout clothes! Boy would I LOVE to win this! So many, many awesome things on amazon. I have SO many items on my amazon wish list – it would be so nice to just pick something instead of just adding it to a list :). I would put it toward a stand mixer that I’ve been wanting. Thank you for the chance. Thank you so much for this awesome giveaway, I love Amazon. this would help me get closer to the Fit Desk that I want to get! Thanks! Thanks so much for the chance. I would use it for holiday expenses. What a nice thing to do for your facebook fans! And, who doesn’t love Amazon–I know I do! This would be wonderful for Christmas! Would love to win this awesome giveaway! Thanks! Thanks for the giveaway! Love Amazon! Very nice giveaway, thank you! I would saving for Christmas. Thanks for the chance to win. I would give this to my son because he has a birthday coming up and would love it. Thanks for the chance to win! I love Amazon! Who doesn’t? great giveaway and good luck to everyone and may you all have a wonderfilled day! I would use it for books and gifts. Congrats on your achievement. Thanks for the giveaway. Thank you. I would use the GC to buy a Learning video for my grand daughter. Thank you!!! If I won I would buy my son a hammock for his boy scout trip next week! glad to find your blog, very generous giveaway! You share such great deals, of course I’m a facebook fan Thanks!! Thank you for giving all of us a chance to win a $50 Amazon Gift Card!! Could use this for Christmas gifts!!! Thanks for the chance. Could use this to buy my little ones some clothes or maybe shoes. Nice giveaway, thanks. Amazon!!!!! Luv, luv, luv. This would be a big help for Christmas shopping! Thank you for the chance! If I won I would use this for Christmas gifts for my 3 kiddos! Thanks for the awesome opportunity!!! I love shopping at Amazon – I’d use this for Christmas shopping! Thank you for the opportunity to win this great prize. I love your blog and visit it often. Great! Can’t go wrong with an AGC. Thanks for the giveaway and the blog! What a great giveaway, I would definitely use this to do some early christmas shopping. Thanks so much for the giveaway! I love Amazon! This would be great for something for my new (remodeled) kitchen! I would buy some CDs if I won. I love Amazon. This would come in handy for Christmas gifts. Thanks for this wonderful giveaway. Thank you so much for the great giveaway, I love your blog! Great giveaway, thanks. Who doesn’t love Amazon? Christmas/Birthday shopping for sure! I have a lot I need to get. I love Amazon! Thanks for this giveaway! Thanks so much for the chance to win!! Would love to be able to use this for Christmas shopping. Who doesn’t love Amazon?! Thanks so much for the chance to win! Thank you for the giveaway!!! This would be great for the upcoming holidays. We find a lot of great deals on Amazon.com. Great site and can’t wait to see the next deal! I need a new microwave. I would love to win this for Christmas shopping. Thanks for the chance to win, I love Amazon and I love to buy books there. Glad to have discovered your sweet site today. Always buying kitchen goodies on Amazon cheaper than the stores. Lovely giveaway! Thanks so much! Amazon is, by far, my favorite place to shop–we get all of our home basics there, from paper goods to pasta! I hope I win…thanks for the giveaway! Good luck everyone!!! Thanks for the awesome giveaway! I’m excited thank you for an awesome giveaway! Good luck to all. Thanks for the giveaway! I would buy books for my kids! congrats on your great milestone! thanks for the chance! i’d love to get books, thanks! Thanks for hosting this amazing giveaway! I could always use an extra $50 to put towards Christmas gifts this year. I appreciate the opportunity. Hope you have a terrific weekend! Congrats on achieving that many fans! And thank you for the giveaway. If I was lucky enough to win, I’d use the money for bills. Thank you for the giveaway! I would get a toaster oven. I would buy some of the things in my shopping cart on Amazon!! Just in time for Christmas shopping! I’d love to win! This $50 gift card would come in handy for Christmas presents. Thank you for the chance to win this! It would be very helpful for Christmas time! What a great prize, this would go to my daughter for her baby shower. This would be amazing with a baby on the way! Thank you for the fun! I’d love to put this toward the Silhouette Cameo I need. I would love to win and put the gift card towards the purchase of a new iPod, Thank you for the chance! I would use the gift card towards a pair of boots! I love amaon.com and I wuld love to love. Great prize! I love the Subscribe and Save deals on Amazon. Thanks for hosting the givveaway! I would use this for kindle books! I would love to have to buy more coffee and some Christmas gifts! Thank you for the giveaway. Hope that you have an awesome weekend. We’ve got a lot of things on our Amazon wishlists Thanks for the giveaway! I’d really like to put it towards some Christmas shopping! I got a new Kindle Fire HD for our Anniversary that is the 26th of Sept so I will be buying books, books and more books if I am the lucky winner.. Sure would be nice. Good Luck everyone!!! This would really help with some Christmas shopping this year. Perfect for Christmas shopping! Thanks for the chance! Congratulations! Thanks for the chance to win an Amazon gift card – I love Amazon – that is where I buy everything! This would be great for Christmas presents! I love amazon! Thank you for the giveaway. This would help on Christmas gifts. Congratulations. Thanks for the great giveaway. Thank you, would love to win. I would save for a good Amazon special, or get books. I love this giveaway idea! I need money for school supplies on Amazon! Would love to win this! Thanks for the giveaway! I could really use this for Christmas. Don’t really know how I’m gonna pull that off this year. Great giveaway–I think I’ll save it for the little extras I’ll need soon for baby. Thanks for a great giveaway. Love Amazon. Thank you so much for the generous giveaway. I love shopping at Amazon so it would be fabulous to win. Thanks for the chance! I could do a lot of damage with a $50 Amazon card! Music, movies, books, food. One stop shop! This would be great to help with Christmas shopping. I would use it for birthday presents. I love shopping at Amazon. Thanks so much for the chance to win! Thank you for a wonderful giveaway, love amazon! This gift card would be a great start on Xmas. I’d love to use this towards Christmas shopping! I would put it towards Christmas gifts! I would use this towards Christmas gifts…need to start shopping soon! This would be a terrific start to my holiday shopping. I would start Christmas shopping if I won. I would love to buy a new phone if I won, Love Amazon! I’d definitely use this to jumpstart my Christmas shopping! If I were lucky enough to win I would purchase some books for my children. Congrats on the fans. Thanks for the giveaway. This would go towards my boys christmas and bdays gifts. I love Amazon! This would help so much with the next few months, two birthdays and the winter holidays. Congratulations on your facebook fans and thanks for the giveaway. Congratulations! Thank you for a great giveaway. Congrats on hitting a milestone! May you have many more! Id love to have the extra cash to spend. I would buy a kindle. Thanks for running this contest – would be great to win for x-mas presents. I’d use the gift card to buy eBooks. Thanks for the giveaway…Xmas presents ! Thanks for the chance! Have a good night! Thank you for the chance to win this gift card. This would be great to get a nice case for my tablet! I’d save it for Christmas shopping. =) Good Luck Everyone! I love shopping at Amazon. This would be awesome. Just in time for holiday shopping! I have an Amazon wishlist that’s 9 pages long and goes back 10 years (I’m very patient)… if I won this, maybe I’d finally treat myself to a couple of items off that list! I would love to put this towards my christmas fund! Thank you! I could definitely use an Amazon gift card, because we’re purchasing from their site all the time.